I love the Animal Soup There's Always One Game! My favorite childhood game was Scrabble. Briarpatch is an award-winning company that makes games kids actually want to play. As an added bonus, their games are lovely to look at, with illustrations worthy of your favorite picture books. They offer Good Night, Moon, Fancy Nancy and a whole list of I Spy games, as well as the one I am coveting: A Little Golden Book Circle of Friends Tin, which features the Saggy, Baggy Elephant along with several other old friends of mine… It's sort of a matching game with a board and a spinner, which I totally adore. We were lucky enough to try one of Briarpatch's newest games, Clothespins!, a rummy-styled game in which players try to complete rows of laundry cards, either by matching prints or garment styles. It helps encourage attention span, memory and also the concept that different patterns don't necessarily go together– something I keep trying to tell Roo, with varying levels of success. I was surprised at how quickly Roo learned the rules, even catching on with the tricky bird cards that allow you to steal from other players' clotheslines. Roo's favorite part was using the bird cards, can you tell? She's a total card shark. To enter and win Clothespins!, please comment on this post with your favorite game from Briarpatch and what your favorite childhood game was. I agree with you--I like the Circle of Friends game! I think my kids would also enjoy the Thomas Count Your Cars. As a kid I loved Sorry and The Farming Game!! Thanks for the chance!! The I spy games look great! I think my daughter would love the Beddy Bye Baby game. Our family is really into Ispy, so those would be super for us. My favorite childhood game...Monopoly. My niece loves Fancy Nancy so Fancy Nancy posh bedroom would be the one we would be interested in. My favorite childhood game was life. We didn't own it so it was always my first pick any time we went somewhere that had it. No one would ever play it with me though. I love their Fancy Nancy Posh Bedroom game. My girls would totally go for that. My favorite childhood game was Yahtzee. I have fond memories of going across the street to play with our neighbors' grandkids and eating her homemade brown sugar cookies. "Candy Land." "Mousetrap" was fun, but every time that it got knocked down, it took forever to put it back together. Our family enjoys playing board/card games very much. Please enter me in your terrific drawing. I would love to add the Beddy Bye Baby game to our nighttime routine! I used to love Monopoly, I still do! I spy games! My favorite childhood game would probably be Candyland. I was disappointed when they updated the board . . . I like the old gingerbread men and the way the old board is decorated! I think my fave is anything I SPY. As a younger child, I enjoyed Candyland, and a little older, Monopoly!! I like their Animal Soup card game. My fave growing up was checkers. My favorite Briarpatch game is I Spy. The new 15th anniversary edition looks great! My favorite game as a child was Candyland. My favorite game from their site is I Spy Memory Game 15th Anniversary Edition. My favorite game as a child was Boggle. My favorite game as a child...I'm not sure. We played "Chinese checkers" a lot because it was my mom's fave! The I-Spy Memory Game looks pretty cool! My favorite is the little golden books circle of friends game. My favorite as a kid was Candy Land! I think my kids would really enjoy the Sea Monsters game. My favorite game as a kid was Hungry Hungry Hippos. As a kid, I loved playing Scrabble. I was such a nerd for it that I would play it by myself, alternating between the two hands of letters. Incidentally, I love your blog header. Very pretty. my favorite game is the clothespins game. when i was a child my favorite game was monopoly. Animal Soup looks cool. My favorite game was Sorry! We love I spy games. My favorite game as a kid was pick up sticks. My favorite games has always been Clue, Monopoly, and Candy Land. Haven't seen the Fancy Nancy card game before. Definitely need to get that for my daughters. My favorite childhood game was Chutes and Ladders. My favorite game was clue. I love the Animal Soup There's Always One Game. As a child I loved playing dominoes with my grandparents. We are trying to instill the love of games with our children. Hope to win this great game! We played Clue and a game called TAKE OFF a lot as kids! We love games. I loved Chutes and Ladders as a kid and Briarpatch's cool game is Beddy Bye Baby! I love the I Spy Preschool Game! This would be great for my son! I think I'd like the Fancy Nancy Posh Bedroom game. We love that book! My favorite game when I was little was Hi-Ho Cherry-O. As a child, my favorite was Candyland. My favorite game growing up was parchesee. DaVinci's Challenge sounds interesting. As a kid, I was all about Uno. From Briarpatch, I'd like to try Dinosaurs, Extinct? My kids adore dinosaurs. I Spy Preschool game...love this...thanks! The I Spy games look fun for my son. My favorite game as a child was Candyland. We love Apples to Apples (older kids) and my youngest loves eeboo games. This one looks really fun though! My little girl would love the Fancy Nancy games. As a child, I loved Go Fish and Old Maid. My son informed me that I like the Thomas Tracks and Trestles game. Phew! I'm glad he told me! My fave game when I was little was Uno and Hi-Ho-Cherry-O. Hungry Hungry Hippo was up there, too. Fun prize! 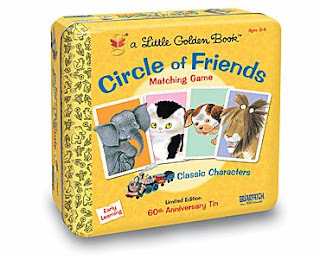 A Little Golden Book Circle of Friends Game looks like a lot of fun. Monopoly was and still is one of my favorites. Thank you so much! The matching pictures Good Night Moon game looks neat! And my fave childhood was Go Fish! Goodnight Moon and I loved a game called Acquire. i like the i spy game and we played the board game sorry. I love a good I spy game... but my favorite growing up was Uncle Wiggly. I think it was the crazy characters or something. Thanks! This looks like a fun game. The Nerdy Wordy Crossword Game looks fun too. My favorite childhood game was Sorry. I like the Thomas Station Stop Matching game. Favorite childhood game was Perfection. I like the Animal Soup game. I can see Annika asking to play that one over and over. My favorite childhood game was Operation. I so tortured the poor Milton-Bradley patient. It's a good thing I didn't become a surgeon. My favorite game when I was young was a Strawberry Shortcake board game. Funny that all those characters from my childhood have made a comeback! My daughter would probably love the Beddy Bye Baby game at Briarpatch. I loved playing Candy Land! I remember playing Candyland alot. My favorite is the Fancy Nancy Posh game and I loved Monopoly when J was growing up! My fave childhood game was Yahtzee! Wordy Nerdy looks fun. My favorite game as a kid was "Careers". My son loves board games. His current favorite is Stock Market. Newton's Apples looks fun and so does Sea Monsters. I had a game called cops and Bank robbers that I loved. I also used to play endless games of Checkers with my Grandma. Beddy-Bye Baby. And I liked this weird game called "Don't Break the Ice." The Thomas Count Your Cars Game is my favorite. As a kid, I best remember the game SORRY. Pollyanna was another game I loved, that a friend's dad made from scratch. The Circle of Friends game looks like one my grandprincess would love! Please enter me in your give away! The animal soup game looks really cute. My favorite game was go fish. My favorite childhood game was Sorry. DaVinci's Challenge looks superb! My favorite game as a child was something called "Probe". I guess it would be similiar to how Hangman works minus the pencil tallies leading to imminent death. It had no paper and pencils, just cards on a special playing board. It was so much fun! The babysitter has an I Spy game and i just love it! I Spy Preschool Game. My favorite childhood game was my Cabbage Patch Kids matching game. I like the I Spy Games. Memory was my favorite childhood game! 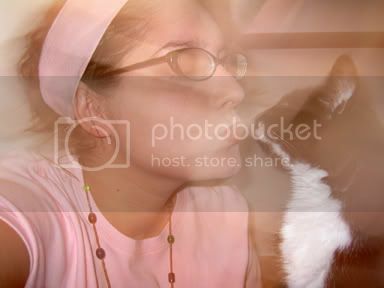 The Do You Look Like Your Dog? game looks like fun and something silly for my daughter. I love playing games with her and my favorite as a child was UNO. I like the I Spy Children's Jigsaw Assortment- way cool! My favorite game as a child was Operation! I like the animal soup game! I like the beddy by game and I really like all of them for my grandchildren. Sudoku the Ultimate Puzzle Game! As a kid, loved Monopoly! I Spy looks like a great game. My favorite game as a kid was Ants In The Pants. This game looks like fun. I think that my family would also enjoy I Spy Private Eye. My favorite game as a child was Clue and Monopoly. I would love to check out the Goodnight Moon Game. I loved games growing up, so it is hard to choose, but I was totally fascinated by Mousetrap! Animal Soup looks really cute! as well as the giveaway game clothespins! Great looking games! We played Yahtzee "a lot" ! Would love to win the Clothespins game!!! thank you for a great contest! My favorite is Thomas Count Your Cars Game, and was Risk. My daughters would love "Fancy Nancy Posh Bedroom game" but growing up I my favorite game was The Winning Ticket. I Spy Private Eye would be my grandson's pick, and my favorite game was Old Maids. I like the Circle of Friends game! Do you look like your dog looks fun!! !